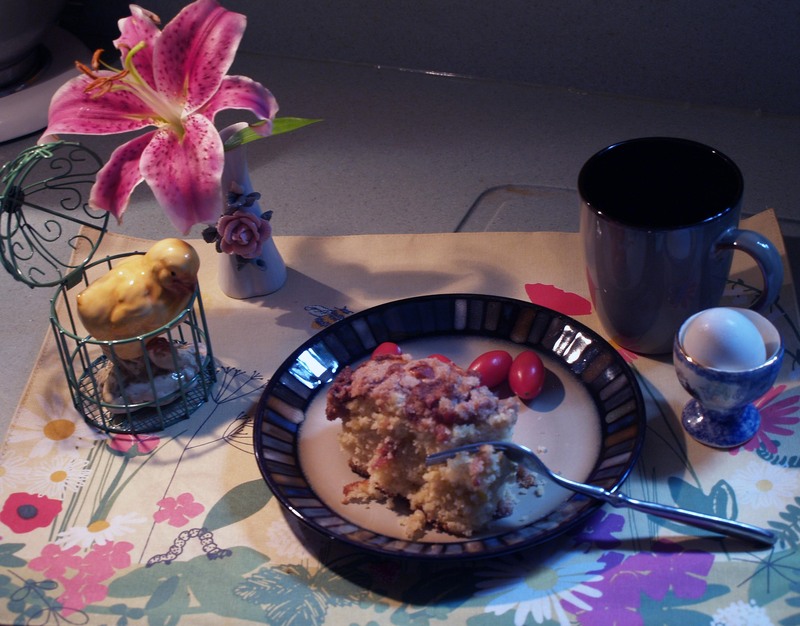 Breakfast Corn Buckle | I Wanna Bake! This week’s bakeventure is a collaboration with Josh’s mom. A special thanks goes out to her for humoring me in my frankenbaking, as well as for graciously sharing her kitchen (and supplies, ingredients, oven, etc.). There was quite a lot of debate over what we should bake, but the two main criteria were that it couldn’t require more than a few hours (we were leaving in the afternoon) and it had to be made out of ingredients that were already on hand (because we are lazy). Lots of ideas were tossed around, but we eventually settled on a take on this blueberry buckle recipe from Taste of Home. A buckle is essentially a coffee cake (think crumb cake). It is so-named because the sugary topping should buckle during the baking process. They are most often made with blueberries, but I’ve seen other berries used as well. Because this is I Wanna Bake!, we couldn’t just settle for the recipe as written (not that we had blueberries anyway). To make it our own, we decided to switch out the blueberries with some corn from the garden, and to substitute a little cornmeal for some of the flour to amplify the corn flavor a bit. 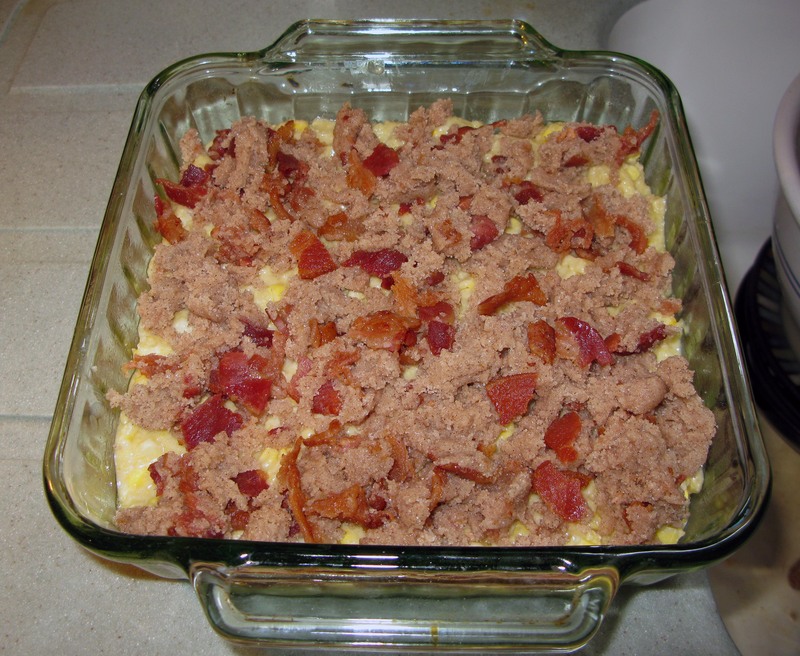 We also added everyone’s favorite breakfast meat to the topping: bacon! I don’t honestly remember how we ended up with the exact configuration we used this time, but it worked out incredibly well despite our worries. The cake tastes a bit like cornbread, but is perfectly light and fluffy. 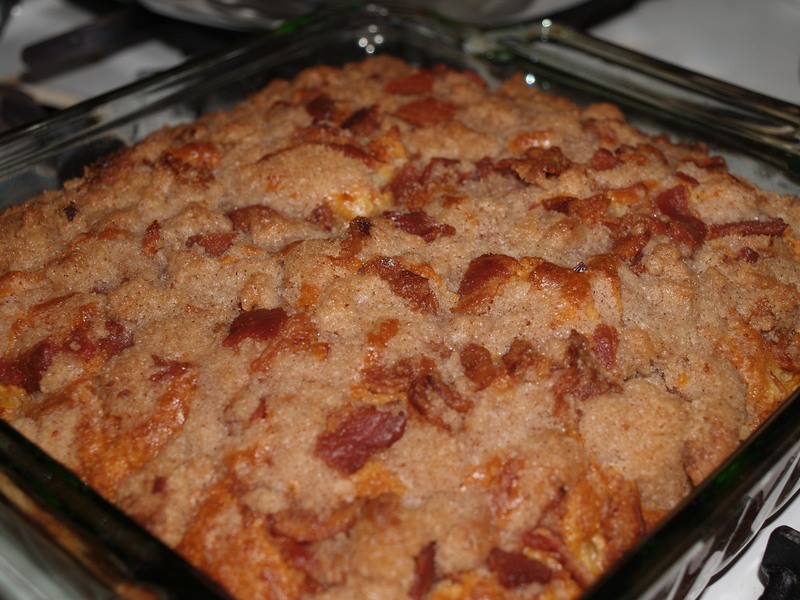 The bacon in the topping caramelizes with the sugar to add a nice bacon candy (as if the cake itself wasn’t enough). Both components tasted delicious on their own, and they went together well too. It did take our buckle closer to 45 minutes to bake, but that’s most likely because the oven wasn’t quite at 375°. Be sure to start checking the buckle after 30 minutes of baking, because you don’t want it to over bake and become dry. If the middle is still jiggly, you don’t need to poke it yet; just bake another 10 minutes or so until you check again. If I were to change anything about this recipe, it might be to add a little molasses or maple syrup to the cake batter. While the topping goes well with the cake, I think it would help to tie the two components together a little more. I’ll be sure to revisit this (first family) recipe in the future, so I will report back on the results. Since this special edition bakeventure took place in Chicago, I will recommend Chicago blues. Notable artists include Muddy Waters, Buddy Guy, and Paul Butterfield (among many, many others). Preheat your oven to 375°F and grease an 8″ square baking dish. 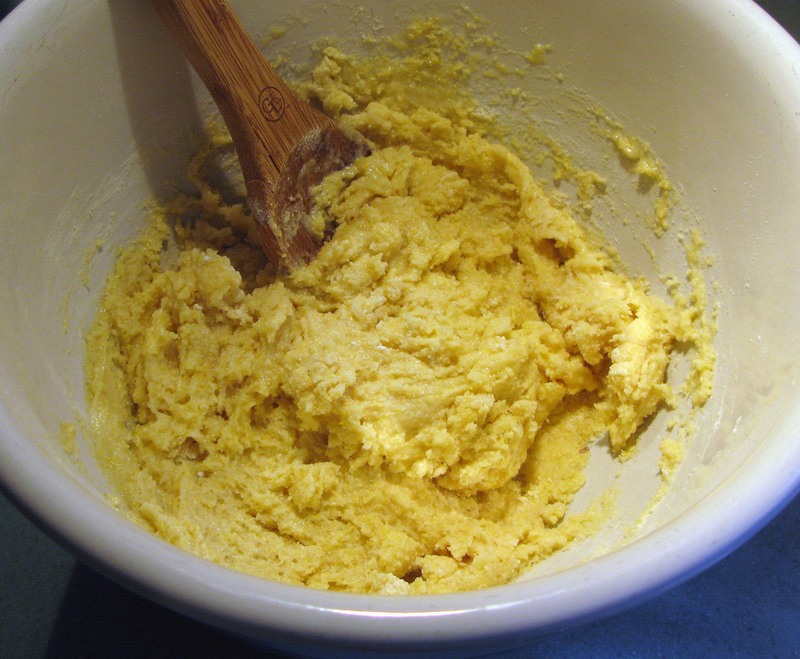 In a large bowl, whisk together the flour, cornmeal, sugar, baking powder, and salt. Set aside. 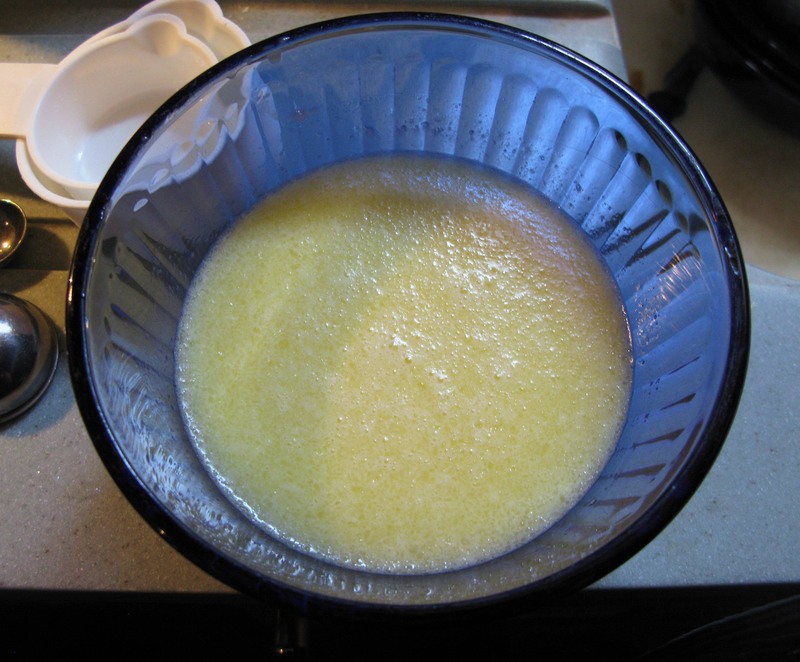 In a separate, smaller bowl, beat together the egg, butter, and milk until blended. Pour the egg mixture into the dry ingredients. 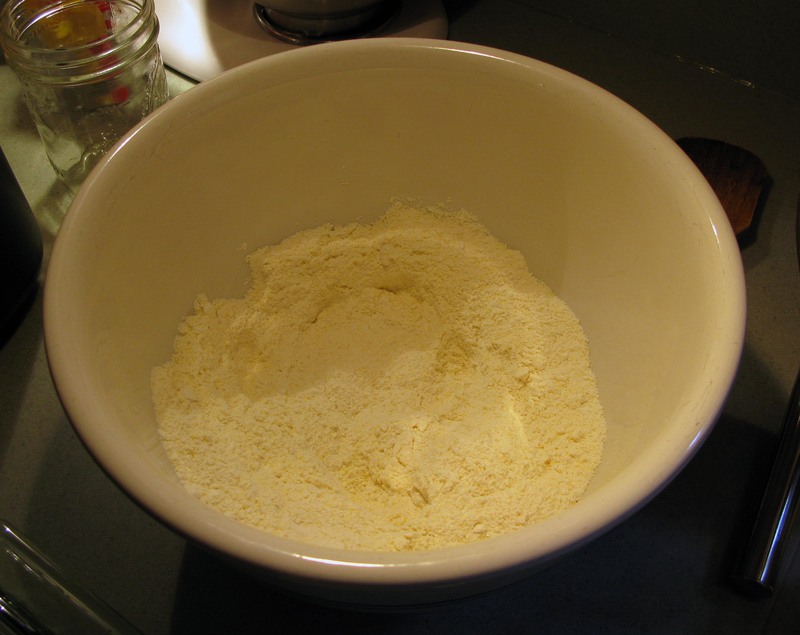 Stir the mixture just until all of the flour is moistened (don’t over-stir). 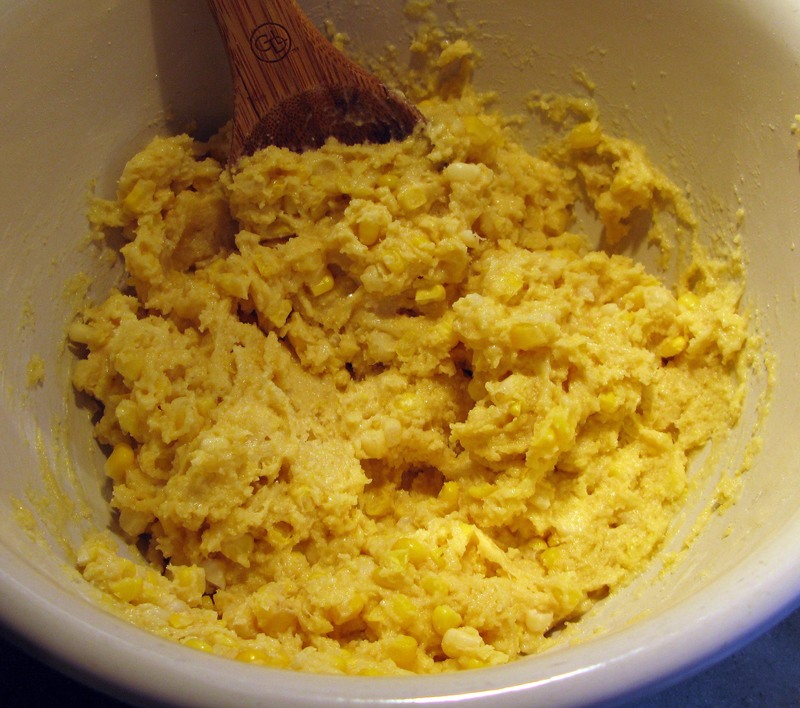 Fold in the corn kernels until they are evenly distributed throughout the batter. 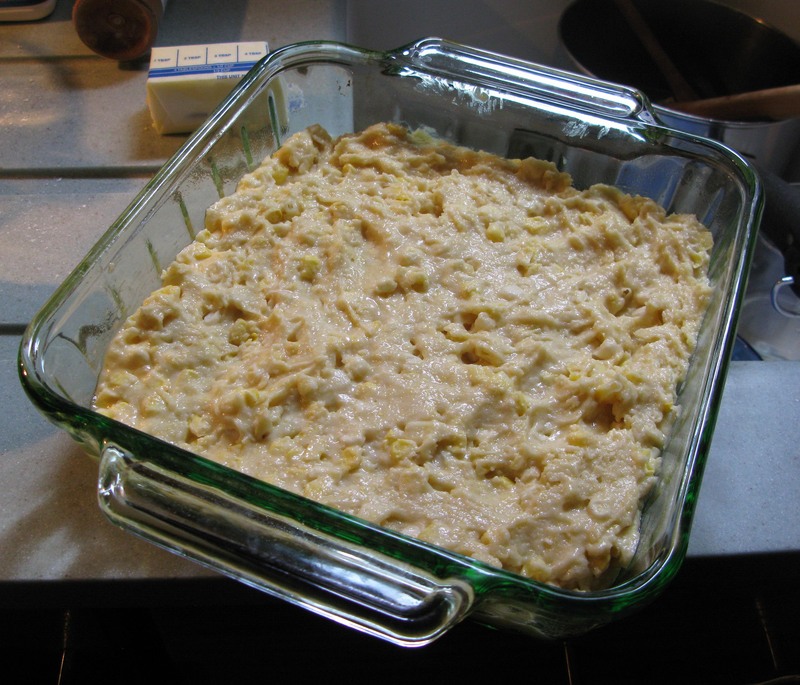 Spread the batter evenly in the greased baking dish. Smooth the top with a rubber spatula or butter knife. In another bowl, prepare the topping. Stir together the sugar, flour, and cinnamon until uniform. 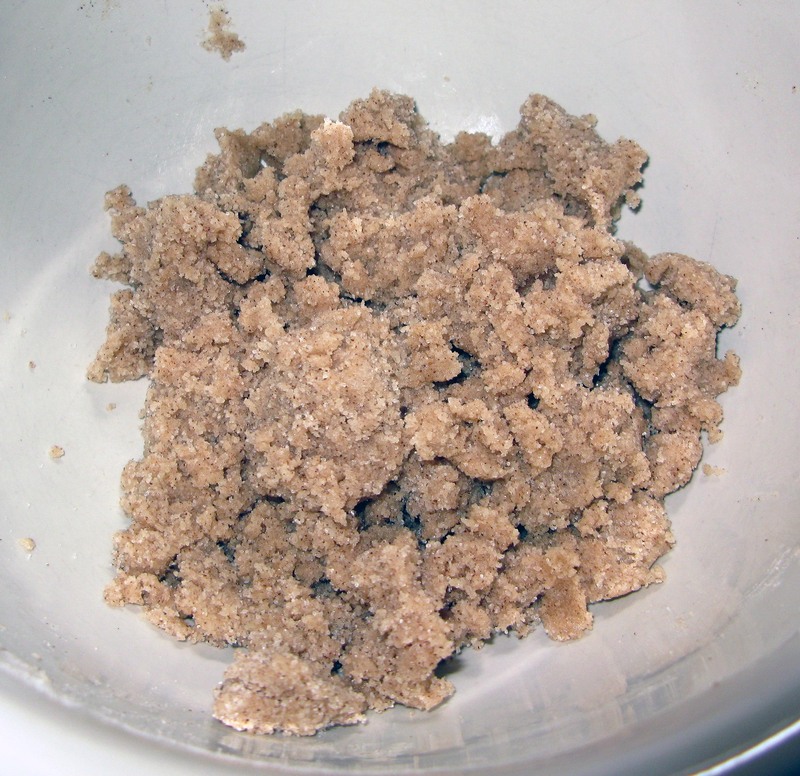 Work in the softened butter until you have large crumbs of deliciousness. Add the crumbled bacon and mix until it is evenly distributed. Sprinkle the topping across the top of the buckle batter. Bake the buckle for 30-40 minutes, or until a toothpick inserted in the center comes out clean. Leave the buckle to cool for about 15 minutes (or as long as you can stand), then slice and serve warm. Store leftovers in an airtight container.